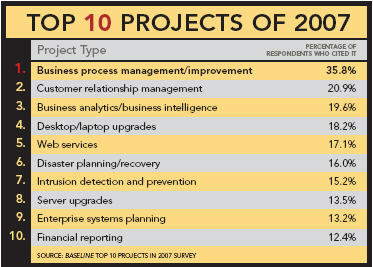 I would not have guessed Business Analytics / Intelligence was the Number 3 priority. Good thing for analysts, someone is going to have to make sense of all that data and provide concrete direction…which seems to be the part hanging people up these days, not the analysis. I imagine this BI activity has a significant role in driving success for #1 – BPM. Full article with spending estimates and more details at Innovations Magazine here. With all the stories I hear and read about the failure of CRM investments, it’s comforting to know that Innovation magazine can say payback usually comes in 2 to 3 years. Especially on that $50 million investment.